Almost exactly three years ago, away back in 2015, I wrote a short post about the Hamilton musical. My kids have a standing order that requires them to keep me updated with the latest pop culture from the youths. And my daughter was already in love with Lin-Manuel Miranda and the way he incorporated music and dance to tell the story of Alexander Hamilton. While I hadn’t seen the show, I was able to read enough, see enough, and hear enough to be convinced about the power of the story. And was convinced that using the story and music would be a great way to help kids better understand the broader story of the Revolution and America’s founding fathers. Last Friday, while in Chicago for the #ncss18 conference, I finally had the chance to actually see Hamilton in person. I am now even more convinced about how this secondary source re-telling of the period of the late 1700s can help connect our kids to both past and present. And while Hamilton is a particularly spectacular example of the power of music and emotion to engage the learner, it’s not the only way we can use music in the classroom. So this morning, I’m re-posting another quick set of resources that I put together a year ago that can help you begin to think about what the integration of music might look like. I am not musically inclined. I like music. I listen to music. Love the Spotify. But I don’t play an instrument and karaoke only in large groups. 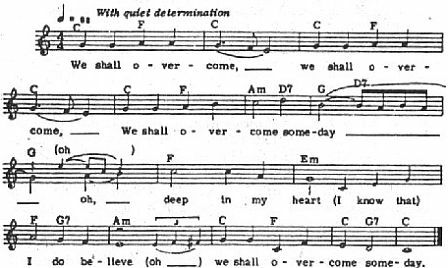 Maybe I just never had the right training but it’s hard to imagine any music teacher being very successful in coaxing out my inner Bob Dylan. Which is why it’s not easy for me to think about using music as an important piece of social studies instruction. You might be the same way – integrating music and song lyrics into your classroom just isn’t the first or second thing that comes to mind when you’re designing lessons and units. I was reminded last night how powerful music can be and how we can use it to help kids connect with our content during the weekly #sschat. 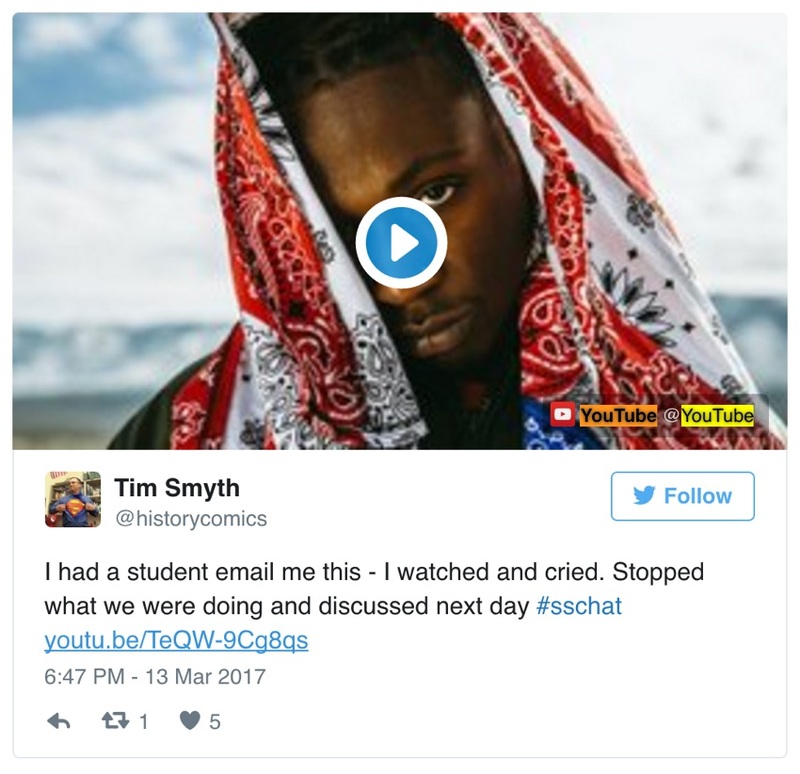 Focused on the intersection of music and social studies, the chat provided a wide variety of useful ideas and resources. Musicals are great storytelling devices that provide additional context and richness to historical content. Many teachers have been using Hamilton as part of their lessons. The National Council for the Social Studies Social Education journal has a great Hamilton article and this presentation from a recent NCSS conference is also useful. The NCSS has many other articles and lessons on the use of music. Listening for History: Using Jazz Music as a Primary Source and Integrating Art and Music into Social Studies Instruction are two examples. Another helpful article is “I Didn’t Raise My Boy to Be a Soldier:” Ideas and Strategies for Using Music from the National Jukebox to Teach Difficult Topics in History. Pre or post learning writing prompt: What would be the music themes for different historical figures? As in, what would Abe Lincoln play at his political rallies? This could be current songs or songs of the period. Explain your thinking. A variant would be walkup music. Most MLB baseball players have specific music playing as they walk to the plate. NBA players have specific music during introductions. What would Harriet Tubman’s walkup music be? Create both mini and full-blown DBQs that incorporate music and lyrics as one or all of the primary sources. Songs and their lyrics are great primary sources, helping our kids to make sense of time, place, events, and culture. Use the National Archives and Library of Congress primary source analysis worksheets to help students make sense of lyrics and context. Songs have been used for protest and social justice forever. Vietnam, civil rights, American Revolution, South African apartheid, women’s rights. If there’s been a protest, there have been songs that have gone along with it. The New York Times Learning Network has a great lesson that models what this might look like in your classroom. The flip side of protest songs might be to have students look at how governments use music to rally support or as propaganda. Perhaps compare and contrast the music of the Allies and Axis governments during World War Two. Look at songs sung in the US during World War One. One #sschat post discussed how US Civil War music was very upbeat, cheerful, and optimistic in 1861 but changed the mood and lyrics changed over time by 1865. Ask kids to look at context and events that may have had an impact on the music of the time. We can ask our students to look at how popular music develops and changes over time. What’s the history of music? How have different groups and their music influenced what we listen to? There are lots of songs that we sing but never finish. This Land of Your Land and Star Spangled Banner are examples of songs with verses that we don’t sing. Why were those verses included by the author? Why don’t we sing them very often? The American Historical Association published a longer read way back in 1996 titled Different Drummers: Using Music to Teach History that highlights why and how music should be part of what you do. And don’t forget the power of YouTube. So many of the songs – both new, old, mashed up – are available online. This is a no-brainer. Thanks for all you’re doing for kids. I loved this post. I’m an aspiring teacher who plans on using music and sports history to engage my students. My tentative plan is to have a small section of class time set aside where students hear music from the era we are studying. The resources you list above as well as Adam’s suggested Teach Rock site are fantastic. I will definitely put them to good use. In a few of the placements where I’ve observed other teachers, many of them are using music as the hook and then something like Hamilton, Pete Seeger, or even Springsteen’s take on folk music to drive further questioning. Like you, I’m no musician, but my son can sing so I live vicariously through him. I am quite, however, quite the lyric hound and geek out when analyzing lyrics from multiple time periods. Jazz from the early 1900s, any music from Appalachia, even the hip-hop from 80s and 90s have so much more to say than just “dance to me”. Music can be such a powerful tool for connecting emotion and learning. We as teachers don’t use it enough so I’m glad that you’re planning to integrate music and lyrics into your unit designs! Good luck as you begin your teaching career! Let me know if I can ever help in any way.